2011 has been so far a very cruel year when it comes to prominent ufologists and Forteans passing away. 2011 has been so far a very cruel year when it comes to prominent ufologists and Forteans passing away. Budd Hopkins, the famous artist, author and expert on alien abductions, was just the last one in a long list. Open Minds published his obituary last week as well as a second piece by me that included the posting of an exclusive video interview with Hopkins done by Italian journalist and ufologist Maurizio Baiata. In this article I want to pay tribute to all the other researchers who passed away this year both here and abroad. Unfortunately for me, I knew personally every single one of them—some better than others—but their varied contributions to the field ought to be remembered. Ion Hobana, the dean of Rumanian ufology, was a gentleman and a scholar. 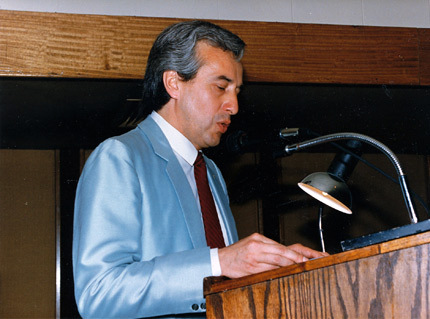 He passed away in Bucharest last February 22, but I didn’t learn of his death until I attended the World UFO Symposium in the Republic of San Marino in April, where he used to be a regular speaker and where he was eulogized by his friend Cristina Aldea. I met Hobana at a couple of symposiums in San Marino a few years ago and he was a very agreeable and competent researcher and author. 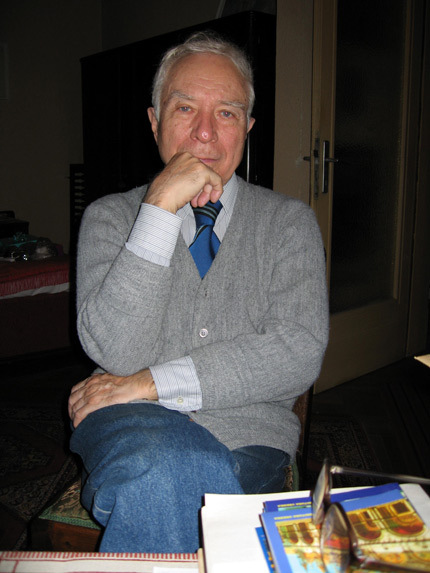 Hobana was by far Rumania’s best known UFO researcher and writer and a well known cultural figure in his country where he served as General Secretary of the Writers Union for many years. 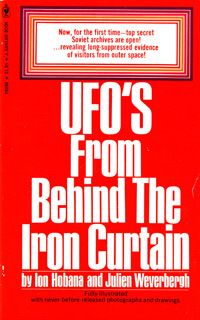 He was best known in the West for his book, co-authored with the Belgian writer Julien Weverbergh, UFO’s From Behind The Iron Curtain, published originally in 1974 and translated to many foreign languages, including English. This book was a key contribution to the field because it was the first one to provide a comprehensive overview of ufology in the Soviet Union and the Eastern European countries of Poland, Czechoslovakia, Hungary, Yugoslavia and of course Rumania. UFO data from all these countries was very scarce during the Cold War and so Habana’s book, which showed the similarity of the phenomenon despite the political and cultural differences, became an instant classic. In the 1990s he published other UFO books in Rumania, including Enigmas in the Sky From History and The Mystery of Roswell After Fifty Years. Hobana was also the president of the Association for the Study of Unidentified Aerospace Phenomena (Rumanian acronym ASFAN), a pioneering ufological organization in his country. Hobana was far more than just a UFO writer. He was an internationally recognized expert in the history of science-fiction and the famous 19th century French novelist Jules Verne. His university thesis in 1958 was on the history of science-fiction and he was also the author of numerous books and papers on that subject. Hobana translated many sci-fi authors to Rumanian since he was a polyglot familiar with many languages. He received many awards for all his cultural activities, including the Grand Prize from the Polish Ministry of Culture & Arts in 1973 and the World SF Award in Brighton in 1984. He will be remembered fondly by all those who knew him not just as an outstanding researcher but a kind man with a deep culture. Jorge Anfruns Dumont, a true pioneer of Chilean ufology, passed away July 1 in Santiago at the Thorax Hospital, following a long illness. The funeral service was held July 2 at the Air Force Chapel in a ceremony attended by many prominent Chilean ufologists. Anfruns will be remembered particularly for reviving the role of the ufologist in Chilean society in the late 1980s. There had been some researchers and groups in the 1960s, but by the 70s—a period of major political upheaval following the military coup in 1973—it had all died out. Sure, there were still UFO sightings and these were covered by the press on a routine basis but no one was conducting ufological research. There were also contactees and when there was an important UFO case in Chile or abroad, the media didn’t have anybody to turn to except these contactees. This is the point where Jorge Anfruns entered the scene: he was a publicist, the son of a journalist of El Mercurio, Chile’s most prestigious newspaper, and so he understood well the culture of the media. He quickly became Chile’s first known ufologist, someone who could comment on the subject neither as a skeptic nor from a mystical perspective. I knew Jorge Anfruns very well since we worked together in Santiago in the period of 1985 to 1990. I was visiting Chile then often, where I would stay at my parent’s apartment in Santiago for a couple of months, and I was looking for someone who could sponsor my UFO lecture and slide show. Anfruns offered to do it and, with his knowledge of the field and his extensive media connections, the lectures in Santiago were a big success both in public attendance and media coverage. I appointed him MUFON’s Foreign Representative in Chile and he later launched his own franchise, Mufon-Chile, which compiled the “First Catalog of UFO Sightings” in the country. 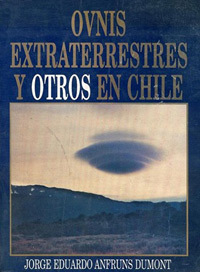 Anfruns was the author of four books, of which the first one published in 1992, OVNIS Extraterrestres y Otros en Chile (UFOs Extraterrestrials and Others in Chile), was the most important one since it was the first UFO book published in Chile in decades, providing an overview of UFO cases in the country. Anfruns also produced a Spanish version of the documentary film UFOs Are Real, showing it throughout Chile and even at army bases. It was in the course of these travels, later expanded to Argentina, that he collected many unpublished UFO cases. He also organized the first UFO Symposium in Chile at the Carrera-Hilton Hotel in downtown Santiago in 1987. In early 1998, Anfruns was the first Chilean ufologist to correspond with then Minister of Defense, Raul Troncoso, about the creation of the Committee for the Study of Anomalous Aerial Phenomena (CEFAA), confirming this agency had been formed with “the goal of collecting, studying, analyzing and classifying information related to strange phenomena… with the purpose of determining if the security of aerial operations in the country are in risk,” as well as “to begin forming a data base with information in the public domain.” Jorge Anfruns will be remembered for his many contributions to Chilean ufology, but probably his main legacy was to establish the role of the civilian ufologist in Chilean society. William Roger Corliss, a physicist and prolific author on scientific anomalies, passed away in Maryland on July 8. He was born in 1926 in Stanford, Connecticut, serving in the Navy during World War II and, later as a physicist, was Director of Advanced Programs in the Nuclear Division at Martins in the 1960s. According to the obituary published in the Baltimore Sun, “he became a prolific writer, authoring 57 books on atomic energy, space propulsion, scientific satellites, teleoperations, wind tunnels, and scientific anomalies in all fields of science.” It was this last category, carried on independently through The Sourcebook Project in Glen Arm, Maryland, that made him a very important Fortean. The website of The Sourcebook Project describes the “Catalog of Anomalies” in the following way: “The Sourcebooks, Handbooks and Catalogs are compiled from 40,000 articles from the scientific literature, the results of a 25-year search through more than 12,000 volumes of scientific journals, including the complete files of Nature, Science, Icarus, Weather, etc. The Sourcebook Project is compiling an objective, unsensationalized catalog of anomalous phenomena.” Corliss was undoubtedly influenced and inspired by the writings of Charles Fort (1874-1932), the great compiler of all kinds of strange occurrences (including early reports of UFOs) now referred as Fortean phenomena. But while Fort pursued this with a unique literary flavor and philosophical approach, Corliss was a methodical scientist bent on classifying all the different types of anomalies. 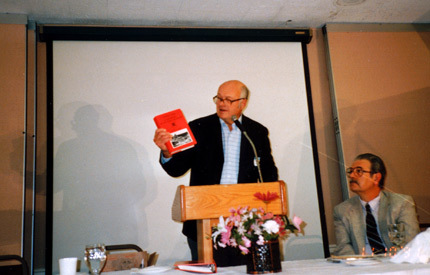 I remember meeting William Corliss a couple of times at the FortFest in the Washington, DC area (nowadays held in Baltimore), where he was a frequent speaker. Despite his impressive amount of knowledge and data, he was an unassuming man who didn’t promote himself or made exaggerated claims. He will be greatly missed by all serious researchers. Hilary Evans, a well known English researcher and author of many UFO and paranormal books, died July 27 at a London community hospital, where he was being treated for several complications. 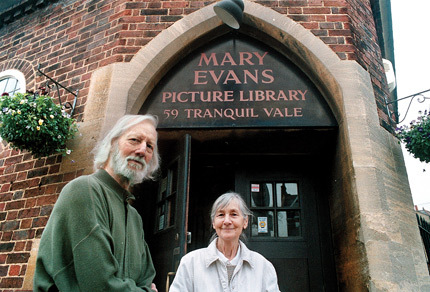 Together with his wife Mary, who passed away last year, Hilary founded in 1964 the Mary Evans Picture Library (MEPL), a huge data bank of old images from the 18th, 19th and early 20th centuries (including many on the history of the paranormal and UFOs) which are used in many books and documentaries. This allowed the Evans to pursue their love of books and conduct their own research. Hilary’s personal huge UFO library was donated to the Archives of UFO Research in Sweden. There were also obituaries published in two major British newspapers, the Guardian and The Telegraph. Hilary Evans was born in Shrewsbury, Shropshire in 1929, the son of a vicar who moved to India when he was a small child. He studied English in King’s College, Cambridge, followed by a Master’s at Birmingham, and worked in the advertising industry as a copywriter in the 1950s. His interest in the paranormal goes back to the 1960s, when he joined the Society for Psychical Research, the British UFO Research Association (BUFORA) and the Folklore Society, co-founding in 1981 the Association for the Scientific Study of Anomalous Phenomena. Using the extensive MEPL image bank, Evans published two beautiful illustrated UFO history books, UFOs – The Greatest Mystery in 1979, and From Other Worlds – Aliens, Abduction and UFOs in 1998. 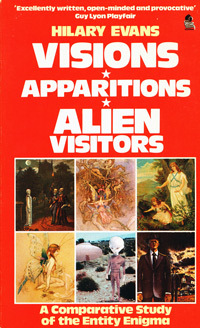 Also important are his two comprehensive studies, Visions * Apparitions * Alien Visitors – A Comparative Study of the Entity Enigma (1984) and Gods * Spirits * Cosmic Guardians – Encounters with Non-Human Beings (1987), which are not picture books (although they include a picture section) but historical and philosophical studies of the different types of encounters with entities, compiled from a wide variety of sources including religion, folklore, history, the paranormal and ufology. 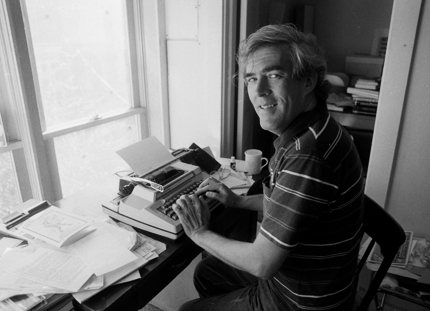 According to the Guardian, “his later books included Outbreak! (2009), which examined cases of mass hysteria, and Sliders (2010), which covered street-light interference, the belief by some people that they turn off street lights as they pass by them.” I met Hilary Evans in 1987 at the MUFON International UFO Symposium at the American University in Washington, DC, where he was representing England and I Chile, and saw him again at a couple of other conferences (I also dealt with MEPL a few times obtaining pictures for my UFO Calendar and other projects). I didn’t know him well, but what I remember was that he was a soft-spoken, true scholar. He was probably skeptic by American standards, but his type of skepticism was very European, not antagonistic or debunking, but very intellectual, looking for the big picture, trying to integrate psychological and sociological trends with the paranormal, not to “explain” it but to better understand these types of phenomena. “Typically,” wrote The Telegraph, “his approach was neither that of the passionate conspiracist nor the ruthless debunker. Rather, he adopted an open-minded, scholarly tone.” He is survived by his daughter Valentine and other family members. Bookseller Bob Girard passed away August 12 in Port Saint Lucie, Florida. 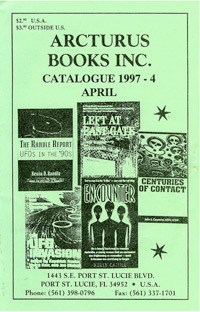 Long before there was Amazon, Abe Books, Ebay and all the other online outlets, his Arcturus Book Service, created in Scotia, upstate New York, in 1980 provided an invaluable service for anybody researching ufology, Forteana and the paranormal. There are a few books in these fields published by major houses, but a lot of material is self-published or put out by very small publishers, which you won’t find in bookstores. Nowadays you can find just about anything online, but that was not the case in the pre or early internet days. That’s why Bob Girard’s Arcturus developed such a loyal clientele all over the world. He moved his business first to Georgia and eventually to Port Saint Lucie, Florida. All right, all you wannabes who simply long to be taken onto a spaceship so that you can get to know all you can about extraterrestrials and their worlds, read this book before you go. You might find out in this book-the most clearly and bluntly-worded description we have yet seen of what it’s really like on that examination table-that, A) it hurts a lot, B) it can be pretty gross, C) you have utterly no control of the situation, D) you’re being used at will-their will, E) you can’t trust yourself once you’ve been abducted and you can’t trust ‘reality’ any longer, and F) no human knows enough about what’s happening here to be of any help to you if you have trouble coping with the totality of your predicament. Bob Girard had a rough side to his personality and could be often rude with his own clients but his wife Monica Williams, a researcher from Guayaquil, Ecuador, was exactly the opposite, she was always nice and polite, and so they made a good team. Besides, once you got accustomed to Bob’s gruffy side, you got to like him just the way he was. I met him many times, he used to have a big table full of books at the MUFON Symposium, the X-Conference and a few other events, where he would usually complaint he wasn’t selling enough to cover his expenses. He was always threatening to get rid of Arcturus for years, but he kept going up to the very end. You can find a couple of additional perspectives on this unusual man in Loren Coleman’s CryptoMundo. All the individuals profiled, Ion Hobana, Jorge Anfruns, William Corliss, Hilary Evans and Bob Girard, made their own, unique contribution to the ufological and/or Fortean fields, and they all should be remembered for what they did and for their true dedication and love of these subjects. Now that they are on the other side they may learn things they missed in this world.